We hope you are well and enjoying Organic Beauty Week. To celebrate all things organic we are offering new members up to £10 cashback at Neal's Yard. As always, it would be awesome if you could promote us. Please see below for more details. 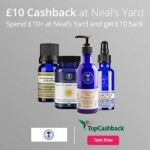 £10 Cashback at Neal's Yard! 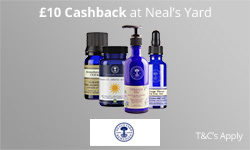 New members purchasing from Neal's Yard get up to £10 Cashback. All new members have to do to claim £10 Cashback at Neal's Yard is follow these four easy steps! New members click 'Get Cashback Now' to go through to Neal's Yard and purchase their natural remedies as they normally would. New members can enjoy organic beauty week knowing they'll be receiving up to £10 Cashback on their Neal's Yard products.